More Vegan Deliciousness From Doug McNish! 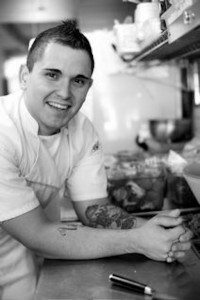 Last week, Canadian vegan executive chef Doug McNish shared his much sought-after recipe for tempeh croquettes. This week, he delights us with two lovely side dishes perfect for autumn — a spiced sweet potato mash and a caramelized onion and cherry tomato relish! I hope some of you are inspired to include these at your Thanksgiving dinner next month. A few days ago, Lisa Suriano (AKA @Veggiecation on Twitter) mentioned a recipe she had for a potato and kale hash. My tastebuds perked up and I immediately asked her if she could e-mail me the recipe so I could showcase it here. Within minutes, Lisa graciously granted my request! So as to not lazily cut and paste someone else’s recipe on here, I decided to use Lisa’s delightful original recipe as inspiration and make a few small tweaks (mainly using sweet potatoes in place of potatoes, and playing around with different spices and condiments). This hummus’ vibrant orange color not only matches the beautiful fall foliage, it also provides some unique flavor combinations for the tastebuds. And, despite the endless varieties of commercial hummus, I have yet to find it at any store! Sweet potato skins contain roughly three times the antioxidants contained in the vegetable’s flesh. This probably helps you understand why I always advocate eating the skin of fruits and vegetables (as long as they are edible, of course). Not only are skins a good source of fiber and certain nutrients — they also provide their own share of antioxidants and phytonutrients. For example, one hundred percent of an apple’s quercetin (an antioxidant that has been linked to lower inflammation levels as well as decreased risk of prostate and lung cancers) content is in its skin! Whether you make sweet potato mash, baked sweet potatoes, or oven-roasted sweet potatoes, leave the peeler in your kitchen drawer! Sweet potato skins contain roughly _____ times the antioxidants contained in the vegetable’s flesh. Leave your guess in the “comments” section and come back on Saturday for the answer. Here’s a super quick, tasty, and healthy recipe perfect for Thanksgiving dinner! I made this last year for my guests and it received wonderful reviews. Rinse sweet potatoes and cut into medium to large cubes. Leave the skins on! 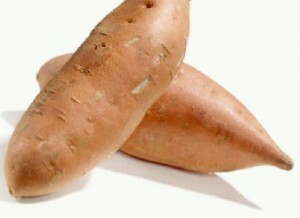 Transfer steamed sweet potatoes to a medium bowl and mash with fork. 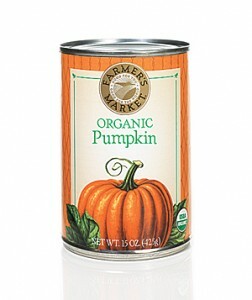 In a pot over medium heat, mix together the sweet potato mash with the orange juice, salt, and spices. Once well mixed, transfer to bowl, top with extra virgin olive oil. Mix lightly with spatula. Enjoy! One medium sweet potato offers 37 percent of the daily vitamin C requirement and 438 percent of the daily vitamin A requirement. This very well exemplifies why I don’t think everyone needs to be downing multivitamins every single day. Foods offer vitamins and minerals in plentiful amounts! This single food (in its mere 105-calorie package which also packs 4 grams of fiber) contains not only the above mentioned nutrients, but also a fair share of manganese (28%), copper (16%), potassium (15%), vitamin B6 (9%), and magnesium (8%). Part of the problem with the overly broad protein/fat/carbohydrate categorizing of foods so prevalent in the media is that nutrients get overlooked. Ask a random person on the street to name three popular diets and they’ll quickly spit them out. Then inquire if they can name 3 sources of vitamin C (other than oranges) and you’ll probably be met with an “Ummm…” and an answer ending with a question mark, rather than a period. It also doesn’t help that multivitamin companies have convinced millions of people that they are either deficient in many nutrients or don’t need to worry about them as long as they pop that pill. One medium sweet potato offers ______ percent of the daily vitamin C requirement and ___ percent of the daily vitamin A requirement. 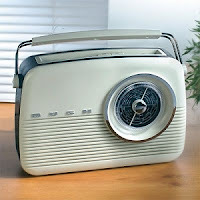 I received an e-mail tonight from Mark Wilson, producer of Radio Live New Zealand‘s current affairs morning radio show, Drive Show. Mark read my Reuters article in the Sydney Morning Herald and asked if I was free late tonight to chat about it live on the radio. I gladly accepted — and here’s the end result! 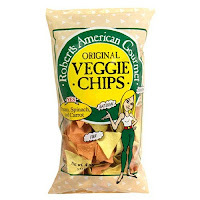 NOTE: Although this post discusses Robert’s American Gourmet veggie chips, it can be applied to any other brand with a similar ingredient list. The packaging boasts “potato, spinach and carrot,” as well as “natural,” but a closer look finds that there is nothing healthy about this rather new snack food. Contrary to popular belief, the inclusion of vegetables (usually in powdered form) to otherwise nutrient-void choices does not make them healthier. Take a look at these ingredients: Potato Flour, Potato Starch, Spinach, Carrot, Beet Root Powders, Rice and/or Sunflower Oil and Salt. True, there nothing is inherently unhealthy (i.e. : high fructose corn syrup, partially hydrogenated oils). There is also nothing inherently nutritious. A baked potato, consumed with its skin, offers fiber, vitamin C, potassium, and some B vitamins, all of which are non-existent in potato flour. Keep in mind that a nutrition label lists ingredients by order of prominence by weight. In this product, potato flour and starch are the big players. Yes, spinach and carrot are there, but a look at the nutrient values makes it clear they aren’t the featured stars of these chips. Remember, the more processed a food, the higher the sodium amount (and the lower the potassium). Granted, we do not know how much potassium is in this product, but keep in mind that whole fruits and vegetables contain virtually no sodium. So, those 375 milligrams indicate this is not just a whole carrot being roasted and turned into a crispy chip. Another clue this is basically just a potato chip with some spinach dust sprinkled on top? The low fiber amount. Vegetables are some of the best sources of fiber (a medium baked potato provides 4.5 grams, a cup of peas packs in 8, and a cup of brussel sprouts delivers 6.4!). These chips, though, deliver a weak 1.5 grams. These veggie chips are by no means the equivalent of a larger order of McDonald’s fries. However, they are not a good choice if you are looking for a nutritious snack, despite what the packaging may have you believe. The potato’s more exotic counterpart has taken a backseat for a while, but after knowing its secrets, I’m sure you’ll agree it deserves the spotlight. Sweet potatoes are an excellent source of vitamins A and C, two antioxidants that help prevent cells from damage that often leads to cancers and other mutations. Vitamin C also has anti-inflammatory properties, making it particularly helpful in decreasing risks of arthritis and cardiovascular disease. Vitamin A is particularly helpful in maintaining our respiratory system in order. The latest research indicates that the cells lining the lungs of people with low intakes of vitamin A lose the ability to battle disease-causing microorganisms. Smokers – pay special attention! A chemical in cigarettes known as benzapyrene has been linked to vitamin A deficiency, thus leaving lungs and bronchii especially vulnerable. Although everyone needs vitamin A, smokers in particular need to monitor their intake. A medium sweet potato only packs 100 calories, but provides 438% of our vitamin A and 37% of our vitamin C needs and, when eaten with its skin, 5 grams of fiber (15% of the recommended daily amount). And, by contributing 18% of the daily potassium we need and practically no sodium, it is definitely a vegetable to have in your “anti-hypertension” arsenal. To clarify some confusion, the terms “yam” and “sweet potato” are (incorrectly) interchanged. 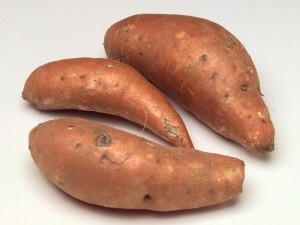 Many grocery stores refer to sweet potatoes as yams. 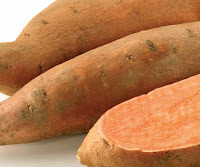 A real yam looks has a rough exterior and, insider, is white and very starchy. Baked sweet potatoes with a little olive oil and salt (or cinnamon if you want to bring out its sweetness) are quick, delicious snacks. For a sinless treat, cut a sweet potato into thin wedges, drizzle with olive oil, flavor with salt and pepper, toss on a cookie sheet and heat in the oven at 350 degrees Fahrenheit for 30 minutes. Prepare to taste just how sweet healthy eating can get!